PCC #282 Tic-Tac-Toe Challenge with Stampin' Up Bubble Over Bundle! 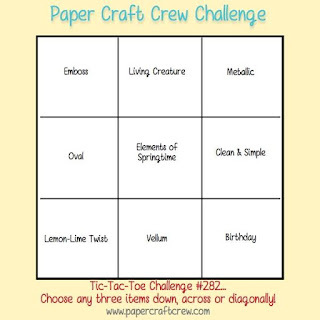 Well of course since it is Wednesday, it's time for another Paper Craft Crew Challenge. This week's Design Team card is for this Tic-Tac-Toe Challenge. I chose to go straight across the bottom row with Lemon-Lime Twist, Vellum and Birthday!